I don’t know about you, but I was shocked to encounter tower defense elements in my Gears of War 3. To be blunt, I absolutely hate tower defense. Wave after wave of enemies flood into your base at predictable intervals while you stand aside and watch turrets do all the work. Tower defense is a genre made for armchair strategists. Much to my surprise, the tower defense elements incorporated into Gears of War 3 enhance the game’s Horde Mode amazingly well. Horde Mode, like its tower defense cousin, has sent predictable waves at players since it first appeared in the series. The ability to construct turrets, barricades, and even mechanized suits of armor, naturally extend the genre’s features into the shooter. Many of the features simply act as extensions to the cover-based philosophy in which the landscape defines player behavior. It all makes sense! But why is there tower defense elements in Assassin’s Creed: Revelations? Here I am, climbing the rooftops of Constantinople, executing Templar guards left and right, stalking my prey from the rooftops, when suddenly: tower defense! Set up barricades, place archers on roof tops, rinse, wash, repeat. The beauty of Assassin’s Creed is, and always has been, its vertical exploration of a rich historical atmosphere. 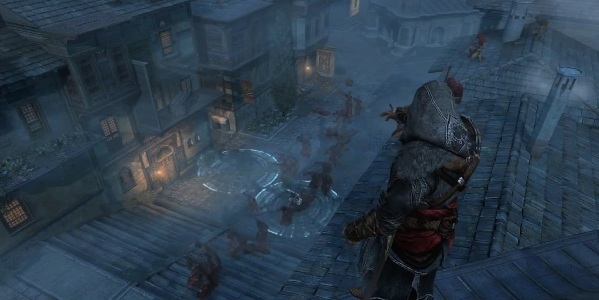 The scenes in which Ezio must defend assassin dens against waves of minions completely abandons the mechanical, aesthetic, and narrative core of the series. Since when does Ezio build barricades? And why can’t the Templars fire rifles or arrows at their rooftop attackers, or climb up themselves for that matter? The tower defense moments make up only a small portion of Revelations. Regardless, Ezio should never have to debase himself with glorified turret placement and micromanagement. Assassin’s Creed has succumbed to feature creep. Rather than let its mechanics evolve and mature naturally, esoteric pieces of other genres appear hastily forced into the stealth assassin formula in a bid to maintain interest in the franchise. Elaborate bomb crafting also bloats the series, offering players largely uninteresting combat tweaks that explode cracks into the game’s poorly adjusted AI. Enemies may hear an explosion, find the mangled corpse of an ally, and then trudge along their predetermined route anyway, completely oblivious to the proximity bombs littering their path. Worst of all, Revelations forces players to make use of the new features. The level design of certain scenarios demands players either utilize bombs or abandon stealth in favor of hand-to-hand combat (never the series’ strong suit). The genre feature creep of Revelations seems the natural outcome of a yearly release cycle that threatens to bore players with repetition. We can expect no different next year, when Ubisoft will release yet another Assassin’s Creed title, this time featuring mushrooms that make Ezio grow taller. It is a shame that the Assassin's Creed franchise has gone down this path. Back at the beginning of this console generation, Assassin's Creed was refreshing. Historical settings rarely played such a vital role in a game's aura and identity prior to that time. But now, Assassin's Creed has all but been stretched and squeezed (each year I might add)in an effort by Ubisoft to encompass a bit of everything. Being distinct and doing specific things well is what gives games a lasting identity in my opinion. The addition of so many tangential (and unneeded) features only serves to lessen the lasting impact that any given title can have on its audience (or at least those who play each entry in the series).